How do you know which contractor should build your home addition? If you’re reading this, you’re probably thinking about adding on to your home. This might be a new room, a sunroom, a covered porch or a screen porch. When we say home addition, we’re referring to adding a room with a roof. Roof structures require cutting in to your house to attach the room. The thought of having a contractor cut into your home to attach a room or porch is very scary. A scary vision of water leakage and durability probably come to mind. You are right to consider not only the positive possibilities of enjoying more space but also to consider the possible problems. Are general contractors better or worse than specialized contractors? Are all contractors the same? What should I base my decision on? When considering whether general contractors or specialized contractors are better, it’s best to compare it to a general practitioner vs. a specialized doctor. Would you want the emergency room doctor to operate on your spine or would you prefer they bring in the doctor who operates on spines all of the time? This brings us to an important point. Have you ever gone in for a medical procedure and asked how many of those procedures the doctor has done? You know the doctor that answers this question with “hundreds” or “thousands” has more to offer than just repetition of experience. That doctor has also seen many different scenarios, done a lot more research, and likely tried different and improved methods. This is similar to choosing a specialized outdoor contractor to build your outdoor room, sunroom, screen porch or the like. We’ve done over 600 projects in the 11 years we’ve been building in the Kansas City market. We’ve build with so many different trim designs, floor designs, trims, materials, etc. 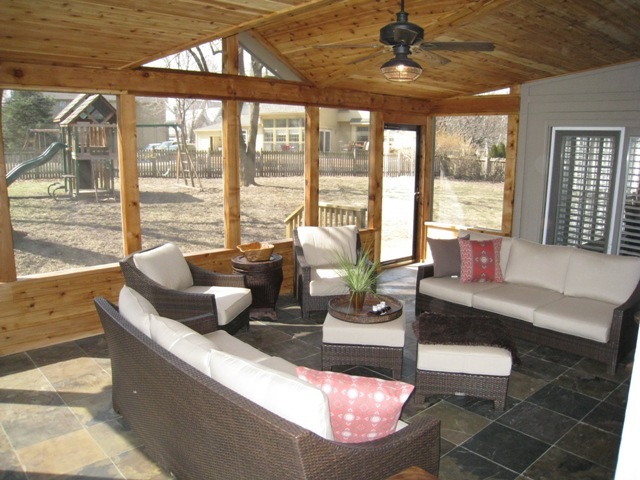 In addition to specialized experience, here are some things to consider and research when selecting a contractor for your attached outdoor room. Make sure the contractor is licensed and insured. Ask for references and don’t assume because they were readily provided that they’re good. Make the calls. You’ll be glad you did. Check their BBB report. Do they hold an A+ rating? This rating level is only available to contractors that have been in business for a period of time. In addition, you have to have no complaints to get the A+ rating. If you are a member of Angie’s List, check the contractor’s references on Angie’s List. As I mentioned before, adding a roof to an existing home requires very specialized experience. It is even very different than building an initial roof on a home. But, in addition to knowing how to tie a new roof into an existing home, the contractor needs to have specialized experience in determining the structural details of the foundation. This depends upon a variety of factors – size, shape, elevation, and roof type. Different roof types require different support structures. Many less experienced contractor will only build one style of roof. Often this is a gable roof which is the roof that makes the shape of a triangle. This is a very popular roof style and it may be the perfect style to fit your home’s architecture and other factors. But, an experienced specialized builder will take other factors into consideration. These include the window placement on the back of the house and how a roof might interfere with that placement, the style of roof on your home and even factors such as drainage. We want to make your room look like it was build with your original home. Another factor is how the roof will affect the light inside your house. Less light will enter the adjoining room(s) because of the addition. We will walk you through what’s best for you. There may be anywhere from dozens to hundreds of choices for each element of your room. 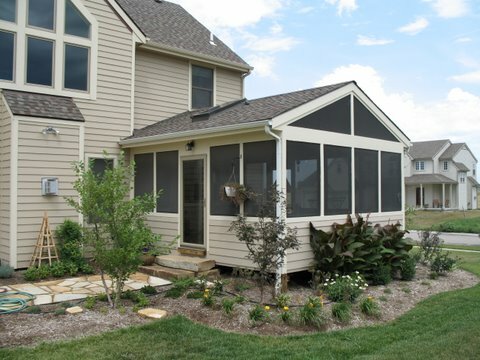 These include indoor trim, outdoor trim, gutters, siding, screens or windows, flooring, doors and so much more. Here is where experience really counts. If one contractor has been in business for ten years, there’s a reason they’ve been in business so long. If a contractor has done hundreds of jobs, you can take comfort in the fact that hundreds of other homeowners chose that contractor. Finally, as I’ve said in previous posts, make sure you like the contractor. Do you feel comfortable when they come to your home for the consultation? Are they courteous and respectful? Opening up your home and yard to people who will be doing a project can be uncomfortable. Go with your gut on the trust and likability factor. This entry was posted in Covered porch, Four-season rooms, Open porch, porches, Room additions, Screen Porches, Sunrooms and tagged Kansas City contractor room additions, Kansas City porch builder, Kansas city sunroom builder, Porch contractor Kansas City, Room addition Kansas City, Season room Kansas City, Sunroom contractor Kansas City on September 7, 2011 by archadeckkansascity.